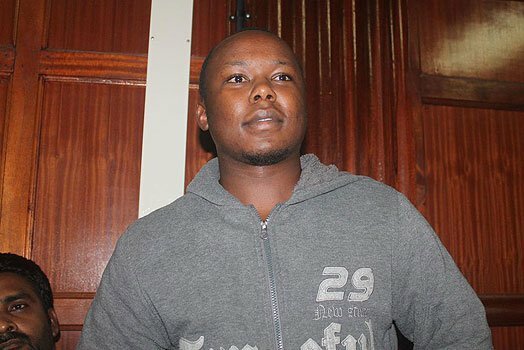 Alex Mutuku, the man accused of being responsible for the loss of 4 billion Kenya shillings from the coffers of Kenya Revenue Authority has appealed to Kenyans to help him raise his bail. The man, who is in police custody, took to Facebook through his brother Alphonse Mutuku to appeal for help. He can only raise Sh. 100,000 and the courts have refused his request to have the bail reduced to a reasonable amount he can afford. He has been in custody for more than 14 days. The prosecution seeks to have him detained for 40 days because according to them he is a national security threat. The story of Alex Mutuku has been marred with misrepresentation of facts and the media frenzy that came with it makes it hard to determine whether he really stole the many or not. Many have suggested the KRA is using him as a scapegoat while the real thieves get away. He has since decried the manner in which the media has handled his story. The Kenyan media is known to have a love for stories that scream scandal whether the stories are verified before they hit the public domain or not. After all the media frenzy, I’ve been forced to respond with a handwritten letter through my brother who has come to visit me. My life was darkest in 2015 and after that I decided nothing will ever take me back to that dark time. Not anyone. Not even this and certainly the media twisting facts. Hence my phrase ‘Nothing can stop me, I’m all the way up…’ I’m sure most of you are familiar with the lyrics. I’m always smiling. Even now, I have learned to love myself. And trust me, I’ve never loved myself more than I do now. Now, since 2015 I’ve never taken time off. I struggled with a lot of things but eventually overcame all. So, 2017 is here and what do I do? I decided one of my new year’s resolution is a trip of East and Southern Africa and one international trip. I buy my international ticket and embark on the east African trip. From city to city. On bus. No flying- too expensive – and I document everything on my FB timeline. By the time, I get to Tz, I’ve spend 73k, already broke and the deadline to register as a voter is quickly approaching. I decided to come back. Now, it has all been twisted as ‘living large’. Wow. But I understand people have to make a living- in this case selling more copies. By March I have ticked two resolutions for this year. I get back, I’m arrested. Why? KRA has lost 4B. Not a million but billion. When they told me that, I laughed. I laugh even now. I’m not stupid. Clearly, I’m the patsy. Those big cajunas at KRA looted the cash and then in a smoke-filled room, smoking their cubans – forgive my imagination, it probably was an office- decided this. Anyone with half a brain can figure that out. Four billion doesn’t just disappear like that without anyone noticing- for years. Even slowly. 1. I DO NOT have 4B, or any part of 4B. In fact, my life’s savings are not even remotely close to one billion, let alone four! 2. I have NEVER worked at KRA nor do I know anyone who works there. If I did then I do not believe I’d have queued all those hours renewing my license or transferring my bike ownership. Those queues are just life draining. 3. I believe this is a test and just like every storm, it will pass and I will emerge victorious. The truth never stays hidden. All will be revealed in due time. God’s time is the best. For now, I’ll keep smiling and praying. 4. Everyone who knows me personally knows that I don’t like asking everyone for it. My bail ruling is coming up on the 28th of March and I’m praying and hoping for two things. One that I be granted bail and two, it’s a REASONABLE amount. Now reasonable of course is relative to everyone and for me that’s 100k as that’s what I can afford. But I’m not the magistrate. All I can do is wait. On that note, I’m humbly asking each and everyone to help me however they can. It can be through a contribution, praying for me or even coming to give me moral support on 28th. I f you would like to contribute towards my bail, here is how. 1. Go to Mpesa. Then pay via paybill. 2. Use paybill 522522 and A/c number 1153642247, [Alphonce Mutuku] . 3. Enter the amount you want to contribute then send. You will receive a confirmation from MPESA and KCB too. The little you have; be it 100,200,500… 1M etc., or even that 4B, I’ll forever be grateful and will remember it as the time Kenya stood by me. If I had this 4B, trust me I wouldn’t be asking. I’d just use part of it to pay but I don’t have it. Lastly, here is my advice. Let no one steal your joy. Live your life to the fullest like I do. I learned the hard way that life is a precious gift from God and every moment should be treasured. That’s why I will never stop smiling. No matter what. Peace. Please share with everyone…friends, groups, WhatsApp etc. P.S: For now, my Facebook account is under my brother’s control so he can’t respond to messages, comments etc. but I hope I will do so soon.